Dive into colour with these artist quality colouring pencils with high quality smooth leads. They give depth of colour and are easily blended. Suitable for dry, mixing and blending. Can use on a variety of materials. Costs: Around £1.60 in 2000? receiving stock including the website. 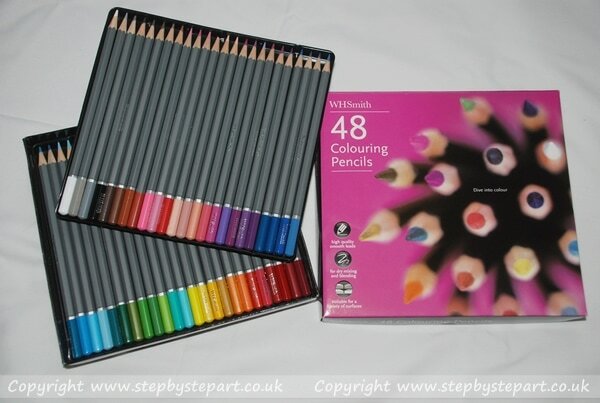 If you are just starting out with Coloured pencils, I would recommend these pencils to start out with as they have so many good qualities, the main one being the price. They offer you a chance to try Coloured pencils as a medium and practice your techniques without wasting money on an expensive brand especially if you feel Coloured pencils is not the medium for you at the end of it all. The colours are strong and you can also layer with these pencils, something not always possible even with some professional ranges! As I use these in my Coloured pencil Workshops and they come as part of the Coloured pencil Kit, the colour charts shown here give an indication of the colours you will find in the pack of 36. My favourite colour in this range is the Flesh coloured tone which is found in the pack of 36 and 48, so would recommend buying the full set and trying them out yourself. A colour chart is a good tool as it helps you to familiarise yourself with the colours. So, What can they achieve? 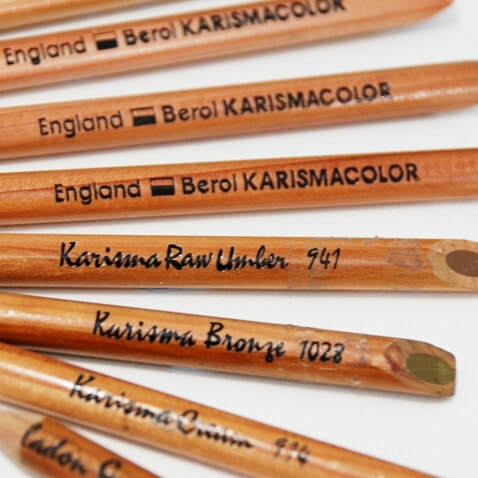 As already mentioned, I have used these pencils in my Coloured pencil Workshops for 5 years. I even had a set of these in my pencil collection in the 90's so they've been around for at least 20 years. They do have their disadvantages as well as the advantages but I would definitely recommend them to anyone first starting out with Coloured pencils as they offer a lot of benefits that many professional pencils also offer. It is important to stress that these pencils are NOT lightfast and that the binders and pigments that are used in creating these are most probably of a far lower quality meaning they will fade considerably quicker than lightfast ones which is why I would not recommend them for professional use. There may only be 48 colours in this range but you can still get great results with a minimal palette. Using only 8 colours, I was able to create the majority of detail in this Blue Merle Shetland Sheepdog. By lightly applying a few colours and layering over the application with other tones, you can add extra shades to the palette. One of my most used colours in this range is the Flesh coloured tone (seen to the far left of the image) which is perfect for skin tones too. These pencils are very versatile, they sharpen well and the colours are bold. How Do These Pencils Compare to Pro Ones? The great thing about these pencils is the price and so working on a textured paper such as this Black Colourfix by Art Spectrum means it really does not matter that the pencils wear down a little faster on the gritty surface. If you are just starting out with Coloured pencils, and trying out different surfaces too, these pencils are the cheapest option whilst allowing you to learn, adapt and improve your technique. As you can see, the colours are extremely vibrant and cover extremely well on this paper. ﻿Some cheaper Coloured pencils tend to be rather weak in colour application, but these pencils work well on all paper tones, even creating bold colours on darker papers such as this mid grey tone. Both the black and the white pencil colours are strong in this portrait and proves these pencils are far better than their price seems to denote. Most people, me included, would not expect pencils costing so little to be able to achieve so much.